UPDATED: Fri., June 29, 2018, 8:22 p.m.
POCATELLO, Idaho – Retired Lt. Col. Oliver North says his top goal as the next president of the National Rifle Association is to double the membership of the powerful gun lobby. 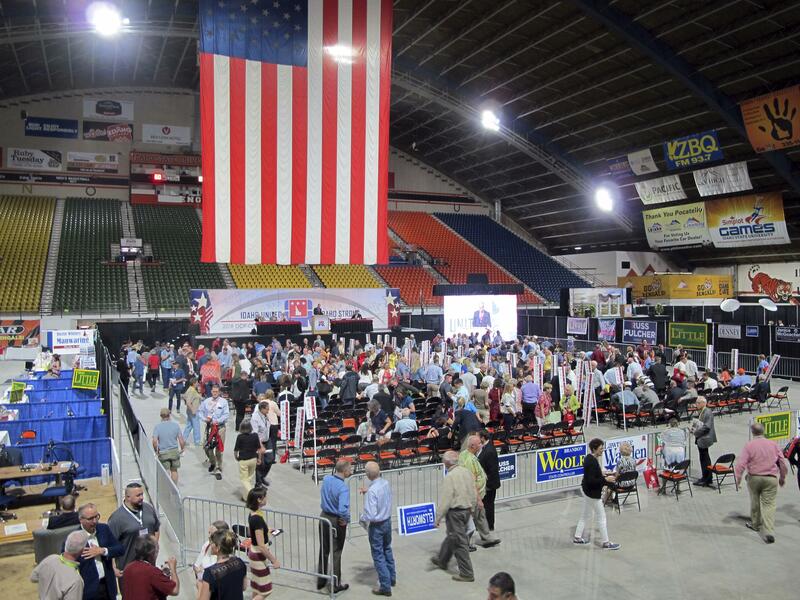 North made the promise while speaking at Idaho’s Republican Party convention Friday. The 74-year-old North defended his organization’s work during his 20-minute speech, calling it the nation’s largest “civil rights organization.” His speech included video testimonials of NRA members sharing why gun rights are important to protect. North, a Marine at the center of the Iran-Contra scandal in the 1980s and a darling of the right, is the biggest celebrity to lead the 6-million-member gun lobby since Hollywood leading man Charlton Heston. GOP officials on Friday noted that Heston spoke at the Idaho GOP convention 20 years ago when he was also first appointed to the gun lobby. BOISE – GOP delegates on Friday called on the Idaho Republican Party to formally oppose a Medicaid expansion initiative expected to be on the November ballot. A Republican delegate panel adopted a resolution outlining the opposition during the second day of the Idaho GOP convention in Pocatello. Just a handful of participants opposed the measure in a voice vote. Janice McGeachin, the Republican nominee for lieutenant governor from Idaho Falls, sponsored the resolution. “Bottom line, this is an expansion of the Affordable Care Act and the Idaho Republican Party has long opposed Obamacare,” McGeachin said. The same group then spiked a similar resolution that would have asked the GOP-dominant Legislature to find a state solution to address the estimated 62,000 Idahoans who don’t qualify for a health care subsidy or Medicaid expansion. Instead, Republicans adopted a proposal urging the state to encourage private nonprofits to provide health care to those who may not be able to afford it. While resolutions are nonbinding and don’t care any weight, they offer insight into the pulse of political parties and provide clues into the top upcoming political battles that could be winding their way into the Statehouse. Lt. Gov. Brad Little, the Republican gubernatorial candidate, has previously said he would not fight to overturn Medicaid expansion if both he wins the November election and the initiative is successful. Under former President Barack Obama’s health care law, the U.S. government pays at least 90 percent of the cost of expanding Medicaid while states pick up the rest. Idaho’s GOP-dominated Legislature has long refused to consider expanding Medicaid, but has failed for years to address the state’s indigent population who cannot afford or qualify for medical coverage. Supporters of the Medicaid expansion ballot initiative are currently waiting to see if their effort will qualify for the Idaho ballot. Election officials have previously said the effort cleared the signature threshold but the state is now checking to make sure it meets other ballot initiative requirements, which isn’t expected to be completed by mid-July. A resolution asking the Idaho Republican Party to respect the will of the voters was quietly withdrawn without explanation before the meeting began. Other top issues discussed during the committee meeting was a call to make city elections partisan to prevent Democrats from taking over local seats, as well as a call to change the Idaho Republican Party logo because the elephant used includes the color blue. Published: June 29, 2018, 11:11 a.m. Updated: June 29, 2018, 8:22 p.m.